Pakistan's human capital has doubled from three years of learning in 1990 to six years of learning in 2016, according to a human capital study of 195 countries recently published in the journal The Lancet. However, Pakistan still ranks a poor 164th in the first-ever scientific study ranking countries for their levels of human capital. India has also more than doubled its human capital from 3 years to 7 years but Bangladesh stands out by tripling its human capital from two years to six years of learning since 1990. In 2016, the Lancet study shows that 44 countries achieved more than 20 years of expected human capital while 68 countries had expected human capital of less than 10 years. Bangladesh, India and Pakistan have less than 10 years of learning, putting them in the category of low human capital countries. Learning is based on average student scores on internationally comparable tests. Dictionary defines human capital as "the collective skills, knowledge, or other intangible assets of individuals that can be used to create economic value for the individuals, their employers, or their community". The Lancet study says it "provides a new measure of expected human capital for 195 countries, consisting of four components: educational attainment, learning, health, and survival, based on a systematic analysis of all available data. This measure, in units of health, education, and learning-adjusted expected years lived between age 20 and 64 years, is estimated each year from 1990 to 2016 and can be updated annually." Learning is based on average student scores on internationally comparable tests. Both Pakistan and India have seen their human capital double from three years of learning in 1990 to six years of learning in 2016 but both still rank low with significantly less than 10 years of learning, according to a human capital study of 195 countries recently published in the journal The Lancet. In fact, the entire South Asia region continues to rank low in terms of human capital. Among South Asian nations, Sri Lanka ranks the highest at 102 (13 years), Maldives 116 (12 years), Bhutan 133 (9 years), Nepal 156 (7 years), India 158 (7 years), Bangladesh 161 (6 years), Pakistan 164 (6 years) and Afghanistan 188 (4 years). Countries with less than 10 years of learning are considered having "low human capital" by the authors of the study. In 2016, the Lancet study shows that 44 countries achieved more than 20 years of expected human capital while 68 countries had expected human capital of less than 10 years. Bangladesh, India and Pakistan have less than 10 years of learning, putting them in the category of low human capital countries. Finland tops the human capital charts with 28.4 years of learning, United States ranks 27th with 23 years of learning and Turkey and China rank 43rd and 44th respectively, each with 20 years of learning. The countries with the least human capital are those in sub-Saharan Africa. Mali ranks 191st (3 years), Burkina Faso 192nd (3 years), Chad 193rd (2 years), South Sudan 194th (2 years) and Niger (2 years) at the very bottom ranked 195th. Conducted by the Institute for Health Metrics and Evaluation (IHME) at the University of Washington in collaboration with University of California, Los Angeles (UCLA), the study on the measurement of human capital has been published in the journal The Lancet. The Lancet report says that "human capital is characterized as the aggregate levels of education, training, skills, and health in a population, affecting the rate at which technologies can be developed, adopted, and employed to increase productivity". Growth in human capital is associated with faster economic growth. The top quartile of countries in terms of absolute change in human capital from 1990 to 2016 had a median annualized growth in gross domestic product of 2·60% (IQR 1·85–3·69) compared with 1·45% (0·18–2·19) for countries in the bottom quartile, according to the Lancet report. In addition to the human capital report by The Lancet, UNDP’s Human Development Index (HDI) is another indicator of human progress that combines information on people’s health, education and income. 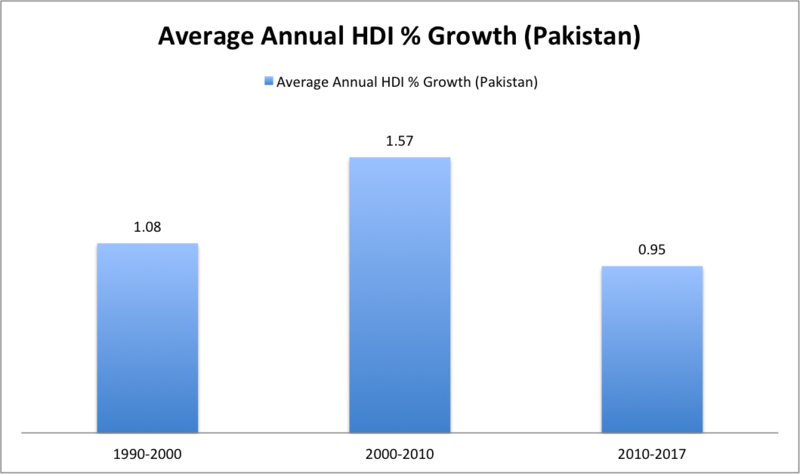 The latest Human Development Report (HDR) shows Pakistan's HDI ranking sank to a new low of 150 in 2018. Pakistan's human capital has doubled from three years of learning in 1990 to six years of learning in 2016, according to a human capital study of 195 countries recently published in the journal The Lancet. However, Pakistan still ranks a poor 164th in the first-ever scientific study ranking countries for their levels of human capital. India has also doubled its human capital from 3 years to 6 years but Bangladesh stands out by tripling its human capital from two years to six years of learning since 1990. Learning is based on average student scores on internationally comparable tests. The Lancet formulation for Pakistan seems to have an error. There will be a steep jump after correction. On the average standardized test score we do better than Indians in various surveys. "nLxt is the expected years lived in an age group x, for year t, in which age groups are defined as birth–6 days, 7–27 days, 28 days–1 year, 1–4 years, and 5-year age groups thereafter; FHxt is the functional health status in an age group x, in year t, transformed to a 0–1 scale; l0 is the starting birth cohort; Eduxt is the years of education attained during an age group x, for year t; and Learnxt is the average standardised test score in an age group x, for year t, transformed to a 0–1 scale"
Anon: "On the average standardized test score we do better than Indians in various surveys." The rankings are determined after calculating six years of expected human capital, measured as the number of years a person can be expected to work in the years of peak productivity, taking into account life expectancy, functional health, years of schooling, and learning. The study “Measuring human capital: A systematic analysis of 195 countries and territories, 1990 to 2016” was published on Tuesday in the international medical journal The Lancet. “Our findings show the association between investments in education and health and improved human capital and GDP – which policymakers ignore at their own peril,” said Dr Christopher Murray, the director of the Institute for Health Metrics and Evaluation (IHME). “As the world economy grows increasingly dependent on digital technology, from agriculture to manufacturing to the service industry, human capital grows increasingly important for stimulating local and national economies,” he said. According to the survey, Pakistanis only have 5.7 years of expected human capital while Finland’s level of expected human capital in 2016 was 28 years. It reveals that people do not live as long in the workforce as most people in the world, taking into account number of years between ages of 20 and 65 – a time when people are the most active in the workforce. On average, Pakistanis lived 39 of those 45 years, putting Pakistan at number 140 of the 195 countries. Overall, Pakistan’s residents had 39 out of a possible 45 years of life between the ages of 20 and 64; expected educational attainment of nine years out of a possible of 18 years in school and a learning score of 68 along with a functional health score of 45, both out of 100. The research also shows Pakistanis spend fewer years in school than most in Asia and around the world. An average national spends 8.6 years out of a possible of 18 years in school; as compared to Bangladesh’s 8.2 years and India’s 10.4 years. That puts Pakistan at number 171 in the world in terms of educational attainment. The country has, however, moved up five places since 1990, when it ranked 176. Meanwhile, Pakistan has done slightly better in terms of education quality. The study measures quality of learning in school and Pakistan ranked 135 in the world – lower than Nepal (127) but higher than India (150). But the country struggles with illness and disability hampering its workforce. The study’s measure of functional health – which calculates the work impact of ailments like stunting, hearing and vision loss, or infectious diseases like malaria or tuberculosis – ranked Pakistan 177th in the world while India’s functional health ranking is much worse at 187. The study places Finland at the top. Turkey showed the most dramatic increase in human capital between 1990 and 2016. Asian countries with notable improvement include China, Thailand, Singapore, and Vietnam. A study conducted by the Institute for Health Metrics and Evaluation (IHME) at the request of the World Bank president, has found that Bangladesh's human capital has improved in quality between 1990 and 2016, reflecting growth in the economy. The improvement in Bangladesh's case has been better as compared to India and Pakistan, the study reveals. Bangladesh's ranking of 161th out of 195 countries in 2016 represents an improvement of nine notches from its 1990 ranking of 170th. However, during that period, India improved only 4 notches from 162 to 158 and Pakistan only one from 165 to 164. Bangladeshis have 6.1 years of expected human capital, measured as the number of years a person will work in the years of peak productivity, taking into account life expectancy, functional health, years of schooling, and learning. The study looks at how many years between the ages of 20 and 65 – when people are most active in the workforce – they can expect to live. On average, Bangladeshis lived 40.7 of those 45 years. That put Bangladesh at 118 of 195 countries. Nepal, Pakistan and India all scored below Bangladesh in this component of the study, but Sri Lanka scored better. Bangladeshis have an expected educational attainment of 8.2 years out of a possible of 18 years in school; as compared to Pakistan 8.6 years and India 10.4 years out of a possible of 18 years in school. Bangladeshis struggle with sickness and disability at work. The study's measure of functional health – which calculates the work impact of ailments like stunting, hearing and vision loss, or infectious diseases like malaria or tuberculosis – ranked Bangladesh at 165 in the world. India's functional health ranking is significantly lower at 187. Bangladesh does slightly better in terms of education quality. The study measures the quality of learning in school and Bangladesh ranked 132 in the world – lower than Nepal (ranked 127), Bhutan (120), and Myanmar (106), but higher than India (150). Learning is based on average student scores on internationally comparable tests. The study places Finland at the top, with the highest human capital score in the world. Turkey showed the most dramatic increase in human capital between 1990 and 2016. Asian countries with notable improvement include China, Thailand, Singapore, and Vietnam. In addition, the greatest increase among sub-Saharan African countries was in Equatorial Guinea. Some of the world's most rapid improvements were in the Middle East, including Saudi Arabia and Kuwait. Explaining India’s ranking of 158th in 2016, an improvement from its 1990 ranking of 162, an IHME note said that it came from seven years of expected human capital, measured as the number of years a person can be expected to work in the years of peak productivity, taking into account life expectancy, functional health, years of schooling, and learning. “Overall, India’s residents had 39 out of a possible 45 years of life between the ages of 20 and 64; expected educational attainment of 10 years out of a possible of 18 years in school; and a learning score of 66 and a functional health score of 43, both out of 100. Learning is based on average student scores on internationally comparable tests. Components measured in the functional health score include stunting, wasting, anemia, cognitive impairments, hearing and vision loss, and infectious diseases such as HIV/AIDS, malaria, and tuberculosis”, the note said. Finland topped the study, while Turkey showed the most dramatic increase in human capital. Asian countries that showed an improvement in the period included China, Thailand, Singapore, and Vietnam. Within Latin America, Brazil stood out for its improvement, the IHME said, adding that all these countries showed a faster economic growth than peer countries with lower levels of human capital improvement. Over the past quarter century, there has been limited progress in building human capital in selected countries that started at a high baseline. The US was ranked sixth in human capital in 1990 but dropped to 27th in 2016 because of minimal progress, particularly in educational attainment, which declined from 13 years to 12, the note explained. I am a bit puzzled by why Pakistan's education system is still doing such a poor job. The middle class has expanded dramatically in the last 20 years, severe poverty has declined sharply, the returns to being educated should be fairly obvious to all, and government spending on education has risen significantly. In addition, a large fraction of children are in private schools and parents who are no longer in deep poverty are willing to spend on private school fees. 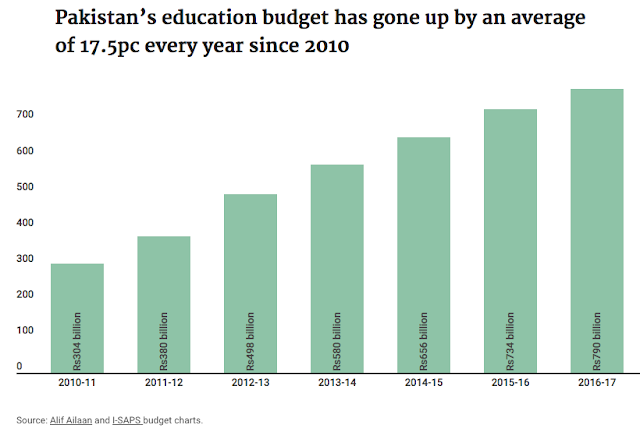 Spending on education exceeded the defense budget last year although total spending both public and private as percent of GDP is probably still too low. Part of it was the baby boom and need to keep up with ever expanding number of children, but childbirths have leveled off so that should not be a problem. Some of it is corruption and ghost schools etc, maybe IK will tackle that. NGOs have done a great job in Bangladesh in expanding education, but they have not played as large a role in Pakistan. 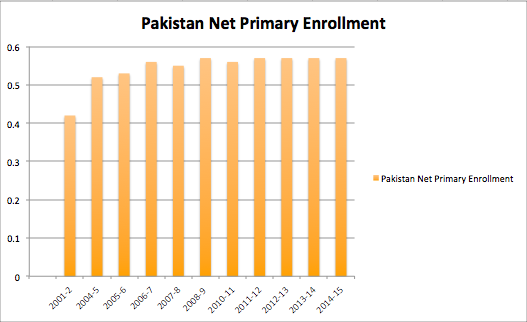 While net enrollment has been flat for the last few years, gross enrollment is still rising and close to 100%, which may reflect children eventually going to primary school but at an older age. What is the rate of enrollment in high school and university doing and as compares with India? You've highlighted Dr Javewd Ghani at KSBL who has a powerpoint on the rising middle class in Pakistan. In 2001, 57% of the population was extremely poor, under 2 dollars per day, 33% were 2-4 dollars/day, 9% were 4-10 dollars, and only 1% lived at a global middle class standard of over 10 dollars/day. By 2015 under 2 dollars had dropped dramatically to 7%, 2-4 dollars had expanded to 45%, 42% were at 4-10 dollars, and 7% were over 10 dollars. This 7% corresponds well to the percent of households that own a car, and seems like a reasonable proxy for who is middle class. By 2030, his projection is that share will double to 15%, while 65% will be in the 4-10 dollar range, and almost no one will be under 2 dollars. 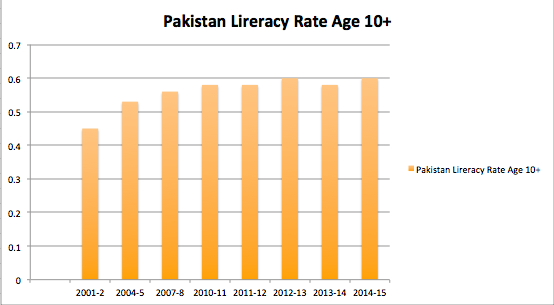 The ongoing social change in Pakistan in the 2000-2030 timeframe is quite stunning. You would think that households not in extreme poverty would make a point of getting their kids educated, but that cultural shift has not fully happened. Some of it is the gender bias against female education, particularly in rural Sindh and KPK. Automation and malnutrition could create a global underclass and provoke unrest on a par with the Arab Spring. This isn’t the opening sentence of a dystopian novel, it’s the bleak picture painted by the head of the World Bank, Jim Yong Kim in a speech at Stanford University about the Bank’s new Human Capital Index, which measures the knowledge, skills and health of populations. The index is a wake-up call to countries that don’t invest in the health and education of their populations. Some countries, however, are getting it right. The World Bank’s Human Capital Index aims to capture the amount of “human capital” a child born today could expect to accumulate by age 18. It does this by breaking down human capital into a series of indicators on health and education. For instance, the index looks at how likely it is that a child will reach the age of five, how many years of schooling they can expect to receive and the quality of that education, as well as whether they eat a full and complete diet and how likely they are to live to the age of 60. The index scores countries between 0 and 1. In a country with a score of 1, all adults can expect to survive until the age of 60, every child can expect to receive 14 years of high-quality education and no child would suffer stunting (when children don’t grow and develop properly and are too short for their age because of poor nutrition). Asian economies take four of the first five places, with Singapore at the top, with a score of 0.88. The vast majority (98%) of Singaporean children can expect to reach the international benchmark for basic levels of proficiency in secondary school. The Republic of Korea and Japan are next with scores of 0.84. A girl born in 2018 in the Republic of Korea can expect to live more than 85 years. Hong Kong SAR is in fourth place with 0.82. Finland completes the top five. However, too many countries achieve a low score. Children in rich countries can expect to receive the full 14 years of schooling used by the index as a benchmark. But in the poorest countries, children can expect to complete only half of that. Meanwhile, 115 million children are stunted as a result of malnutrition, leaving them vulnerable to poor cognitive development and hampering their ability to learn. The World Bank estimates that 250,000 children are in school but aren’t learning because of the poor quality of educational provision. These issues become a stark reality when you compare Singapore’s index rating with that of South Africa’s. In South Africa, which scores 0.41 on the index, only 26% of children can expect to complete secondary school to the same standard as their Singaporean counterparts. In Singapore, a child born today can expect to live until they are 89. In South Africa, it’s 68. This gap in human potential becomes even more urgent when we consider the changing nature of work. Technological advancements will require us to adapt to machines and algorithms taking over tasks previously done by humans. According to the World Economic Forum’s Future of Jobs Report, the Fourth Industrial Revolution will bring significant job disruption. The shift in the division of labour between humans, machines and algorithms could displace 75 million current jobs, but the report also finds that 133 million new roles may emerge at the same time. The World Bank report argues that workers will need “advanced cognitive and sociobehavioral skills" such as “problem-solving, critical thinking and adaptation to new methods”. Otherwise, they will be unable to adjust to the coming changes. With their vibrant scientific models and stimulating explanations, students from the historical city of Thatta, in Pakistan’s Sindh province, not only displayed their talent but also fascinated visitors at the first ever Laar Science Festival. More than 7,000 students from over 50 regional schools and colleges participated in the two-day (Dec 14-15) festival at Thatta’s Sports Complex. A large number of teachers, entrepreneurs, science specialists and government officials also attended the event including Dr Nawaz Sogho, Deputy Commissioner of Thatta, Senator Sassui Palijo from Thatta district, Sindh’s Minister of Science and Technology Taimur Talpur. Admiring the talent of local students in science and technology, minister Talpur promised to establish science centres in the region to groom young scientists. “It’s amazing to see the scientific spirit in the ancient city of Thatta famous for its archaeological, cultural sites and the seat of three successive dynasties,” said Junaid Ahmad Dahar, CEO of Sindh Education Alliance. He agreed with most of the visitors that the high level of participation by the students was a clear indication of their interest in utilising everyday science to work towards solving issues in their towns and cities. Organised by Thar Education Alliance (TEA), Campaignistan, and Laar Education Campaign with the support of District Government of Thatta, the festival reached rural students who would not typically have the chance to attend science and technology events. The science fest promoted a culture of inquiry and hands-on learning in STEAM (Science, Technology, Engineering, Arts, and Mathematics) subjects. “We started this journey of organising science festivals from Tharparkar back in February 2018, and continuing this campaign for quality education in Pakistan” remarked Partab Shivani, CEO Thar Education Alliance and organiser of the event. The theme of the event was ‘climate change’ to raise awareness on the issue as Pakistan has been ranked 7 on the list of climate vulnerable countries. To raise public awareness on the effects of climate change, the event was held in Sindh province, which is vulnerable to increased intensity of extreme weather events such as frequent floods and droughts. Young scientists exhibited projects on solar panels, windmills, water purification, offering innovative solutions to climate change. A project by Nimra Memon, a Grade 12 student at Concept School, Thatta, was highly acclaimed at the festival as well as on social media where her video received appreciation from Climate Change Adviser Malik Amin Aslam. Saudi Arabia has announced 583 fully funded scholarships for Pakistani students at 23 leading universities in the Kingdom. In a joint announcement, Saudi and Pakistani officials said that the Higher Education Commission (HEC) of Pakistan will process applications and award 400 scholarships to students studying for bachelor’s degrees, 100 for master’s degrees and 83 for Ph.D. students hoping to study at Saudi universities. The scholarships will cover all disciplines, except for health and medicine. Planning for the scholarships was handled by Nawaf bin Said Al-Malki, the Saudi ambassador to Pakistan, and Ali Mohammed Hawsawi, the Kingdom’s cultural attache in Islamabad. Hawsawi said Saudi Arabia has been awarding limited scholarships to Pakistani students for several years, but would now offer a much larger number. Hawsawi and Al-Malki discussed the selection procedure of students with Pakistan’s Education Ministry. In the past, Pakistani students had to apply directly to Saudi universities for scholarships or make inquiries through the Ministry of Education. Now only the HEC will process scholarship applications. “We hope when Pakistani students return after the completion of their studies in Saudi universities, they will be able to contribute positively in their respective fields,” Hawsawi said. The HEC is advertising the scholarships on Pakistan national media with Jan. 31 as an application deadline. “This is a welcome addition to the HEC’s foreign scholarships program and we hope this collaboration with Saudi Arabia will continue in the years to come,” Ayesha Ikram, HEC’s media director, said. She said all scholars would be selected “purely on merit” through a system devised by the commission. A total of 250 students would be selected for scholarships and the remainder would be picked next year. The Kingdom will provide health care for students and their families as well as accommodation, food, return air tickets and special allowances, such as two months’ stipend on arrival in Saudi Arabia and three months’ graduation allowance for shipping books. Tertiary institutes where Pakistani students can apply include King Abdul Aziz University, King Saud University, King Faisal University, King Khalid University, King Fahd University of Petroleum and Minerals, and Princess Nourah bint Abdul Rahman University. “I am searching for my relevant discipline at Saudi universities and will apply for the scholarship in a couple of days,” said Azka Noreen, who plans to pursue a doctorate in biochemistry.